This design drew it’s inspiration from the traditional North American Indian and British Columbian symbols and artwork including the choice of colours. Kokopelli is the little man playing the flute while balancing of Jack Rabbit’s back. He is usually depicted with a hunched back and a giant phallus which I have toned down in the interests of propriety and which can be removed by the judicious use of black stitching should it offend. 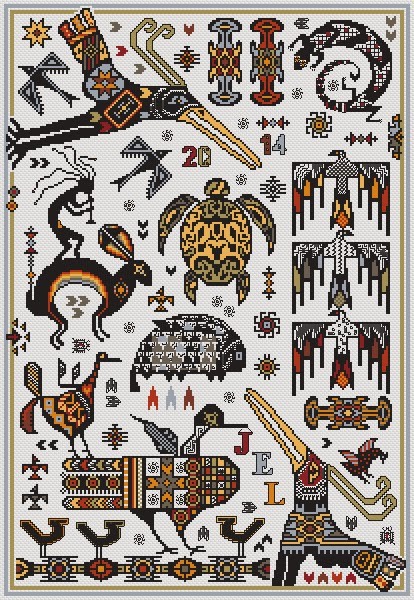 There are also thunder birds, rain birds, and a turtle amongst others for good measure. Wear your waterproofs at all times when attempting to stitch this design! You were warned.